Starting at just £7.50 a pair, Moore’s kipper fillets offer great value and are simplicity itself to cook. 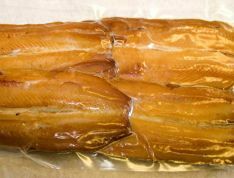 The kipper fillets are 180g to 270g per pair. And as any of our customers will testify, they’ll have you coming back to Moore's again and again. (UK Delivery Only). 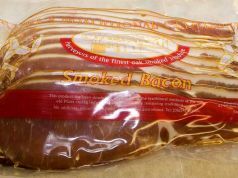 Smoked for over 168 hours, using only the finest back cuts, Moore’s oak smoked bacon is vacuum sealed, sliced and ready to cook. Ideal for frying, grilling or even the barbecue, Moore’s bacon will tantalise the taste buds in a way no other bacon can. (UK Delivery Only). 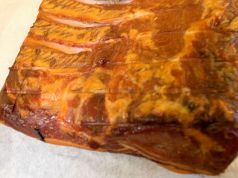 Smoked for over 168 hours, Moore’s oak smoked bacon joints are incredible and will tantalise the taste buds in a way no other bacon can. (UK Delivery Only). 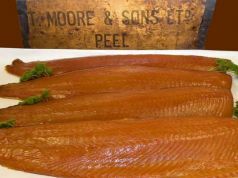 Moore’s oak-smoked salmon is un-sliced to suit your culinary preferences. Ideal for a main course, our salmon is considered one of life’s treats by all those who have experienced it. (UK Delivery Only). 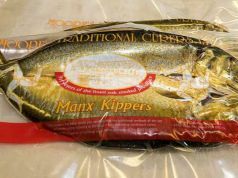 For all enquiries please phone us on 01624 843622, alternatively you can email us at info@manxkippers.com. Available in pots of 220g, Moore’s white crab meat is a delightful taste. Sealed for freshness, you are rest assured that the crab meat will arrive at your door tasting just as nature intended. 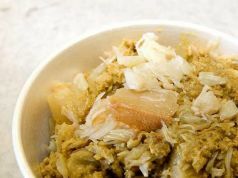 Crab meat is fresh for up to 4 days when refrigerated and up to 6 months when frozen. 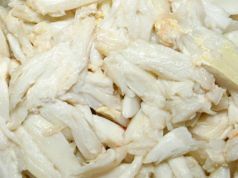 Fresh Crab meat will be sent if available - if not, we will contact you. (UK Delivery Only). 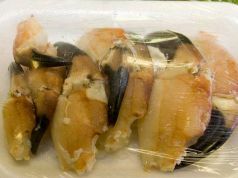 Available in packs of 220g, Moore’s crab claws are a taste sensation. Sealed for freshness, you are rest assured that the crab claws will arrive at your door tasting just as nature intended. Moore’s hand selected queenies are vacuum packed to ensure that none of their mouth watering flavour is lost by the time they reach you. At just £7.99 for a 1lb bag, they represent great value for what is a genuine taste of luxury. Queenies stay fresh for up to 4 days when refrigerated and up to 6 months when frozen. (UK Delivery Only). Moore’s hand selected King Scallops are vacuum packed to ensure that none of their mouth watering flavour is lost by the time they reach you. At just £12.99 for a 1lb bag, they represent great value for what is a genuine taste of luxury. 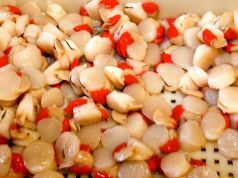 King Scallops stay fresh for up to 4 days when refrigerated and up to 6 months when frozen. (UK Delivery Only).